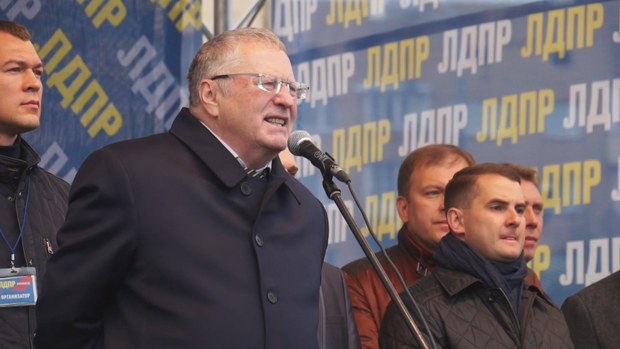 MOSCOW — Vladimir Zhirinovsky, also known as the “Trump of Russia,” just won big in recent elections. And he hopes to be celebrating again in November. “If Mr. Trump is a president of the United States, it would be a holiday for Russia,” he told CBS News. The ultra-nationalist leader is one of Donald Trump’s most vocal supporters in Russia. Even his opinion of Hillary Clinton matches the more radical fringe of Trump supporters. “Madame Clinton has all the signs of Parkinson’s illness. It’s a very bad illness,” Zhirinovsky said. Trump has lavished praise on the Russian leader, Vladimir Putin, and said he’d cut back on U.S. involvement in NATO. Putin has made plain he’d prefer a Trump White House. But Russia’s meddling in the American election is more than just talk. Russia is accused of hacking the Democratic party’s server. If you want to know what Putin is thinking, you talk to Sergei Markov. His political think tank has a direct line to the Kremlin, which sort of denies the hacking allegations. “The word of [the] Central Intelligence Agency in the United States means no. Zero. Nothing. They lied. Just forget about them,” Markov said. Putin has said the hacking of the DNC was a good thing. But how would Putin react if his own United Russia Party had been hacked?